It is not a secret that Canopy Growth (WEED:TO) is one of the most successful cannabis companies. The early investors have definitely enjoyed a share price rise during the last years and more people are still entering this young industry in general. Such a big firm as Canopy Growth has been experiencing quite a high trading volume during the last two years. Thus, it is obvious that market participants are moving within the trading patterns. It is, therefore, a quite useful tool for trading this stock. The question is whether you can spot, recognize and evaluate such pattern. Some may be misleading and fail, some are successful and bring fruitful profits. Hence, below you can see a transparent overview of the patterns throughout the last two years of trading the Canopy Growth stock. Every market has its peak – this is part of every stock market cycle. Thus, also this stock needed to consolidate and that happened in the form of a symmetrical triangle between January and May 2018. The good news about Canopy Growth applying for listing on NYSE had completed the triangle pattern price could fly again. Another consolidation tested the support level and break-out from the rising channel resulted in the record highs of the stock price. The market euphoria formed another pennant pattern, however, this did not end up happily since the overall stock market was hit by correction. This was actually a beginning of reasonably positive correlation between cannabis stocks and S&P 500. 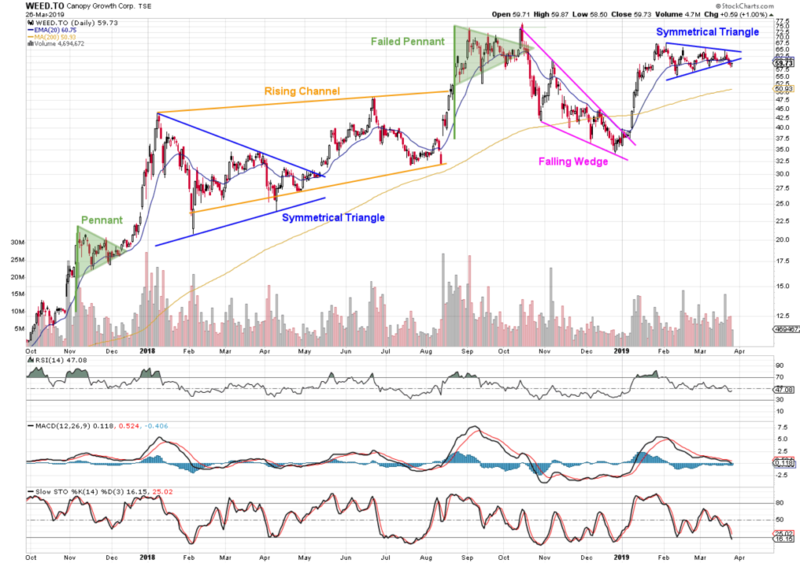 The correction enabled Canopy Growth stock to form a falling wedge pattern. As the stock market bottomed, it was quite clear how this pattern completed and price of the company’s stock pierced through the resistance. The rise in the overall stock market brought also the weed stocks higher and now the consolidation of Canopy Growth is formed again within a triangle pattern. Most recently the price broken down the support level and therefore further consolidation may be happening. The optimism in the broad financial market is not that strong these days due to other macroeconomic and political reasons and hence, drop in S&P can easily drag WEED or CGC down. On the other hand, as the previous pennant failed to break-up, maybe this also just a short-term hesitation of the market and price will surge again. Therefore it is very important to watch current support and resistance levels, and let other technical indicators to prove your strategy!